This video is a synopsis of the projects, themes and trouble-shooting expressed at the Design Days event on May 10-11 at UNICEF NYHQ. We have edited down a conversation between UNICEF sponsored rapid design prototypers to profile what they have created in order to respond to and alleviate actual needs of families and children. This video is intended to help make transparent the iterative process that development must undergo in order to create a new device that can respond to global concerns. Also touched on are ways for the organization to make the process of creating prototypes more streamlined, and the best method to take what is developed and to make it open source in order to create a sustainable and beneficial outcome to those that need it. For Design Days we invited designers and engineers who have worked with us to discuss UNICEF, the design process, and recommendations for future design collaborations. UNICEF needs methods for iterative and flexible design contracting; we can’t always know what the end result will look like. UNICEF would benefit from understanding and discussion of the design process before embarking on projects. We need to work with open-source designers and engineers so that whatever we pay to have produced is public domain. “Research” and “development” need to happen with end users, in the field. Earlier this month, the MacArthur Foundation announced the winners of the third annual Digital Media and Learning competition. There are some great projects, especially the Learning Lab Awardees which won up to $200,000 to further their initiatives. Now that businesses have all rushed to have Twitter and Facebook profiles and to maintain company blogs, has the onslaught of information made it actually more difficult to get your message heard? Business strategy and information technology consultant Stowe Boyd wrote a blog post on Thursday entitled “Thought Leadership: Beyond Marketing” in which he suggests that the rise of social media might be making us immune to marketing. Boyd suggests that startups might benefit from rethinking how they position themselves online to land on the side of that signal-to-noise ratio so that they’re actually heard. Boyd observes that “Even in a time of great noise, people are still looking for guidance: they still need to make informed decisions, and to take action on their own behalf or on behalf of their companies. To do so, they look more than ever to those individuals and organizations that they trust, those that have credibility and hard-won reputations.” In order to capitalize on this search for expertise, Boyd suggests that companies try to situate their online presence less in terms of marketing and more in terms of thought leadership. Boyd says there are three obvious ways to do this: Hire a thought leader. Ally your company with innovative, leading-edge programs. And actively participate in the community discourse in your field, either through written publications or through speaking events. Online communities and resources focused on peoples’ emotional health have been around for a while. This includes the youth space through efforts like icouldbe.org’s online mentoring community which has been around for the past 10 years. And other resources tailored to help youth deal with particular issues, such as thesafespace.org to help prevent and cope with teen dating violence, have been adding value for a while. But online functionalities, coupled with sourced content, designed to help folks deal with emotional issues represent a new direction for the web … an emotional rather than factual web. Consider pepfly. Currently in beta, Pepfly is built on the scientifically supported idea that changing your everyday feelings, thoughts, and behaviors in small ways can have a powerful effect over time. Pepfly is an app that connects people to emotional experiences using the web. Pepfly uses a psychology recommendation engine to recognize the words you use to describe yourself and make sense of them in psychological terms. It uses a matching algorithm to connect your psychological state to a piece of media that might work for you. It uses a learning system to find patterns in your ratings so that it can deliver more of what works for you and less of what does not. Check out their FAQs. Mobile is playing an increasingly important role in learning in Africa. The following are excerpts from a recent article in Education Week entitled “Mobile Devices Deliver Learning in Africa,” by Michelle Davis. School-age children across Africa often don’t have access to a formal education. They may live in remote rural areas or in violence-plagued regions too dangerous for teachers to visit. Others can’t spend a full day in the classroom: They have to work or are heading households left without adults because of the ravages of AIDS. Areas of Africa are “ripe for the use of mobile technology, even more so than in the U.S. because technology—particularly mobile-phone technology—leapfrogs a frayed and ineffective land-line system,” says Matt Keller, the director of global advocacy for the nonprofit One Laptop Per Child initiative based in Cambridge, Mass. In Mali, sub-Saharan Africa’s sixth-largest country, with a population of more than 12 million, 10,000 schools are spread over what is often desolate land, says Rebecca Rhodes, the deputy director for student learning for the country’s Road to Reading program, implemented by the Boston-based Education Development Center, a global nonprofit organization. The program is part of a five-year, $30 million reform plan funded the U.S. Agency for International Development. A variety of other projects involving cellphones are fanning out across the continent. In March, the Washington-based World Bank Institute launched a new type of problem-solving video game called Evoke, which is designed to empower young people in Africa to come up with creative solutions to social problems. Students can play the game by accessing the Web, typically through a cellphone or laptop. Students in South Africa can also sign up to receive weekly text bursts updating them on the latest storyline or mission. Those playing the game may collect videos or photos with their cellphones and can submit them using mobile e-mail, according to the game’s blog. A number of factors have coalesced in Africa making it ready for the use of mobile technology for education, says Robert Spielvogel, the chief technology officer at the EDC. With huge numbers of children lacking any kind of formal education, many ministries of education are focusing on the problem. In addition, a small pilot project in Zambia used cellphones to improve teacher training. Groups of teacher trainees received cellphones and sent text messages to college lecturers asking questions about assignments or social issues. A computing device for every teacher and student so they can access the Internet at school or at home? That, along with an embrace of cloud computing, Creative Commons, and open-source technologies is part of a new set of recommendations from the U.S. Department of Education. On March 5, the department released an 80-page draft of its National Educational Technology Plan entitled Transforming Education: Learning Powered by Technology. The plan lays out an ambitious agenda for transforming teaching and learning through technology. Much of the NETP emphasizes “21st Century learning” as the path to transforming education: “engaging and empowering learning experiences for all learners… and leveraging the power of technology to provide personalized learning instead of a one-size-fits all curriculum.” The plan seeks to challenge the traditional model of the isolated teacher in a classroom, promoting the idea of “always on” learning resources and online communities for both educators and students. In addition to changes to the US education model, there are some bold technology recommendations in the plan. Changes to CIPA (Children’s Internet Protection Act) to open access to the Internet and rethink how filtering works in schools. The most recent Web 2.0 Expo in the Javits Center in Manhattan was excellent. It was an event that was not to be missed if your company was willing to shell out the fees to attend. In a recession you would think the fees for these conferences could be cut down a bit, but that is just wishful thinking because it will probably never happen. 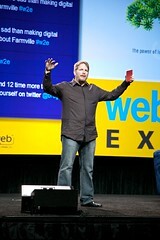 Anyway, the event I enjoyed most was Chris Brogan’s keynote speech. Chris did a great job of breaking down some the barriers that have been erected around Social Media topics to make them very straight-forward. I thought his philosophy in relation to social media advertising campaigns was very insightful, and his insights on Twitter were were exceptional. He proposed, listening and info sharing are more important than narcissistic tweets about one’s self or one’s brand. He proposed that your “re-tweet”(RT) to tweet’s of your own of your own ratio should be about 12 to 1. Ultimately, this quote, resonated with me the most: “…what is more sad than creating electric sheep.” In other words, genuine information sharing is much more important than updating people on every mundane moment of your day. View the video (below) of his keynote for the specifics– it is defiantly worth the 10 minutes if you are interested in social media, online marketing or web 2.0. Chariot Solutions sat down with Rick Rasansky CEO of Yorn, and Roy Rosin VP at Intuit in their offices to discuss why it is important for web developers to be paying attention to mobile development (in the video below). E-learning developers should take heed as well because mobile technology offers the ability to deliver untethered content that your target audience can use where ever they choose to use it when ever the time is convenient. Offering a user the ability to learn when and where he/she is most comfortable is highly effective. The limitations of this technology lie in the fact that there is no single platform that is universal. In the smartphone marketplace Blackberry is dominant with business oriented users, but the iPhone is gaining users rapidly, while Windows 7 Mobile, the newly open source Symbian OS, and the revitalized Palm OS are also attempting to gain a piece of the marketplace. Yet the most dominant demographic is the host of individuals still using text only mobile devices. In developing countries text only mobile technology is sometimes be the primary access users have to the web, so understanding mobile delivery is paramount to companies seeking to deliver content outside of the US. Creating the use cases and understanding the platforms of your user group is vital to develop an effective mobile learning application. Here are two key players in the mobile industry take a look at the video below to get their perspectives on why you should be considering mobile delivery for your e-learning content. Google Labs always has something interesting for me to explore. This time the guys at Google in conjunction with the Washington Post and The New York Times are tackling online news. I think this tool has allot of value, and if it is adopted widely it could change the way we discover, read and research news topics, using online news outlets. The fact that they are offering a open source API makes it even more compelling. They came up with a very powerful way to explore a news topic. They used their search algorithms that are already searching out all of the online sources on any given topic to add context and pull together a research hub on the desired news topic. Here’s how it works. After a search is completed, and a story is selected you are presented with a variety of links of varying importance from any site that has covered the topic. There are a wide variety of ways to filter the content from media type to personalities in the story. It also offers a time line from the stories’ development across the web. The implications for education are immediately apparent. Students now have a way to do one stop research. If they understand how to validate and attribute sources it can save them allot of time. This is an important factor, as classes in media literacy are not currently taught as a requirement in most school district’s curricula. This API is powerful enough to change the way modern news is interacted with and if newspapers are smart they are already implementing it as part of their online offerings. Day 1: Define the Idea: Participants present ideas and set criteria for their proposed mobile learning application. Day 2: Validate the Idea: Participants conduct research with end users and get feedback with learning and marketing experts about their mobile learning app. Day 3: Design the idea: Participants storyboard their refined idea for mobile learning app and begin creating/ modifying their prototype. Day 4: Share the idea: Participants create presentation deck to “pitch” their mobile learning app and finalize their prototype. Day 5: Pitch the idea: Participants will present “pitches” and prototypes to an audience that includes a panel of users, industry experts, and market investors.